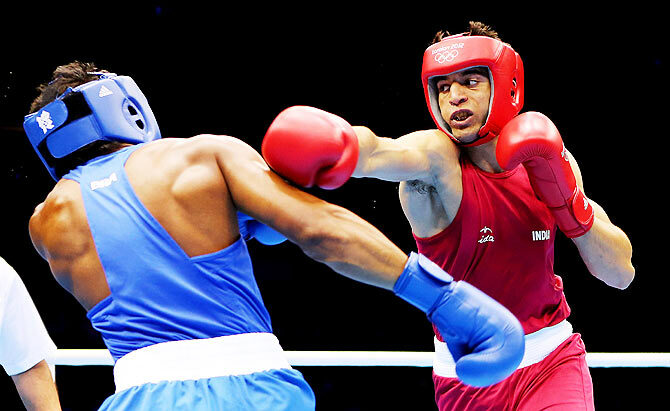 Asian silver-medallist Sumit Sangwan (91kg) and former junior World champion Nikhat Zareen (51kg) were among eight Indian boxers to make the finals, while five others settled for bronze medals in the 56th Belgrade International Tournament in Serbia. Sumit defeated Greece's Vagkan Nanitzanian after his opponent threw in the towel in the third round of the bout on Friday night. The India Open bronze-medallist, making a comeback from a wrist injury, will square off against Ecuador's Castilo Torres in the final. Nikhat, also returning to the ring after an injury-forced break, out-punched Serbia's Nina Radovanovic for a unanimous 3-0 win. The national bronze-medallist will be up against Greece's Aikaterini Koutsogeorgopulou of Greece in her summit clash. Also advancing to the finals were Himanshu Sharma (49kg), Laldinmawia (52kg), Varinder Singh (56kg), Pawan Kumar (69kg), Jamuna Boro (54kg), and Ralte Lalfakmawii (+81kg). Himanshu defeated Frenchman Mohamed Radji 3-0, while Laldinmawia staved off a stiff challenge from Algeria's Mohamed Flissi for a 2-1 win. Varinder didn't have to toil hard for his 3-0 triumph over Algerian Khalil Litim, while Pawan also claimed a 3-0 win against local hope Aleksander Popovic. Jamuna claimed a 2-1 victory over Poland's Laura Gryzb, before Lalfakmawii got the better of Russian Aleksandra Dmitrieva in her semi-final bout. Settling for bronze medals among the men was Narender (+91kg) after going down to Serbian Vladan Babic in a split verdict. In the women's competition, Rajesh Narwal (48kg), Priyanka Thakur (60kg), Rumi Gogoi (75kg) and Nirmala Rawat (81kg) settled for bronze medals. Rajesh lost 0-3 to Russia's Iulia Chumagalakova, while Priyanka was beaten by Korean Oh Ji Yeon, also a unanimous 0-3 verdict. Rumi, too, lost to a Korean in Su Jin Seon in a split 1-2 decision. Nirmala, on the other hand, was defeated by Turkey's Elif Guneri. Will BCCI allow Indian players for Afghanistan Premier League?